As temperatures begin to drop in the fall and winter, no one likes to crank the furnace and dread the next month’s gas or electric bill while still stepping barefoot onto a freezing hard floor. For those that prefer the look of hardwood and tile to carpet and rugs, this is a common concern. 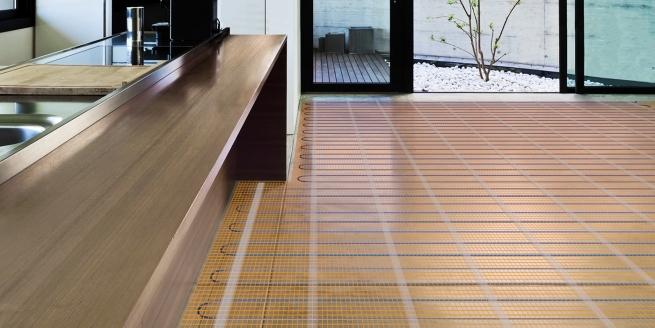 Installing an in-floor radiant heat system is the smart choice. New products have made this luxury more affordable, faster to install, and more energy efficient than ever before. There are many benefits of using this type of system. Radiant flooring doesn’t come out of a vent or baseboard, so it allows for more flexibility in placing furniture around the room. The heat produced is also more evenly distributed throughout the room, creating an overall warmth that many find very comfortable. Additionally, there is no ductwork for traveling heat to get lost in, more of the heat that is produced makes it to the area it is intended to go. Furthermore, is extremely important to find a contractor that has experience installing these systems to ensure the longevity and safety of the installation. Please note that a licensed electrician is required to install the thermostat. 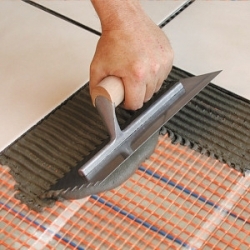 Here at Area Floors, one of our expert team members will show you what in floor radiant heat system will work best for your needs and help you select a compatible flooring product that will keep you warm and toasty for many winters to come.